I'm Sarah -- the lady in charge at Sarah Harste Weavings. 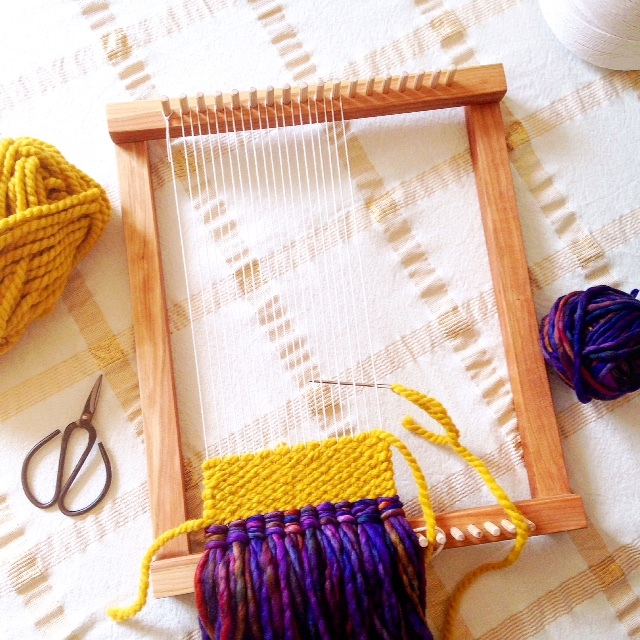 Can I tell you about the day I fell in love with weaving? It was February 2015 and I was off of work for a snow day. I settled down in my bed, pulled my new loom out of it's box, and spread out all my yarn before me. "Okay," I thought, "Let's figure this weaving thing out." Six hours slipped by unnoticed. My finished product laid before me -- a wonky woven thing that was misshapen and I feared was going to unravel right in front of me. But I was beaming; I couldn't remember the last time I had felt so absorbed and inexplicably happy making something. From that day on, I've had a bad case of #weaverfever. Since then, I've made dozens, maybe hundreds of woven wall hangings. And at the beginning of 2016, I added macrame (the art of knotting) onto the bill. It brings me so much joy to create with fiber, and an even greater happiness knowing that people chose to display my pieces in their homes. I think our homes are sacred spaces; for most of us it's the only space over which we have control. The items we place in it -- the pieces we hang on the walls, the chairs we sit in, even the books we place on our shelves -- all have the ability to shape how comfortable and at home we feel in our space. I create each piece hoping that it'll be the piece that you look at and smile every time you walk through the room. I create each piece hoping it brings so much joy to whoever takes it home. I create all of my weaving and macrame pieces in my home studio in Columbus, OH. I'm inspired by vibrant colors and surprising color combinations. I also love to include tons of texture in my pieces. You can find some of my past favorites here. I travel throughout the Midwest teaching weaving and macrame workshops to beginner-level students. I find that my classes are usually evenly divided between students who consider themselves "creative" and those that haven't made anything since their sidewalk-chalk days. Either way, I make sure everyone who attends goes home with a beautiful piece! Interested in attending a workshop? Learn more here. Did I mention I designed the perfect loom just for you? When I decided to offer workshops, I wanted to offer the perfect loom for my students: one with easy-to-use pegs (trust me, they make warping your loom a breeze!) in beautiful hardwood options. So I designed it myself! All of my looms are built by me in my basement-turned-woodshop; they're available in cherry and walnut (and some special runs of more exotic woods!). I'm so happy to offer these beautiful and functional looms to beginners and intermediate weavers alike. 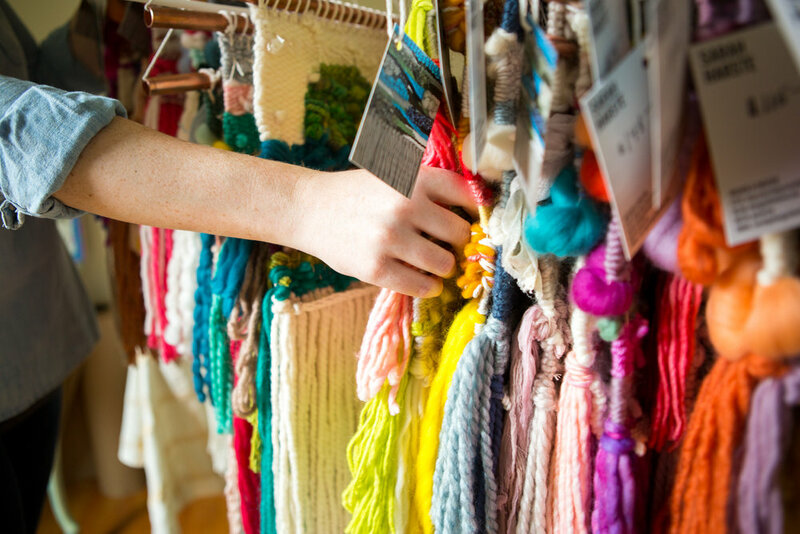 Whether that's designing the perfect piece for your home, organizing a special bachelorette party macrame workshop, or creating a fiber installation for your event or storefront, I'm always excited to collaborate! Learn more about ordering a custom piece and installation work here. And feel free to shoot me an email at sarah@shesgotthefever.com to get the conversation started!